Holiday decorations are an important part of the winter season for many people. They make the neighbourhood seem warmer when the deep cold of January sets in. There’s still plenty of decorating we can do to make your house stand out after we’re installed your extensive display of outdoor Christmas lights. What are your summer planters doing this winter? Let us turn your summer flower planters into eye-catching holiday urns. 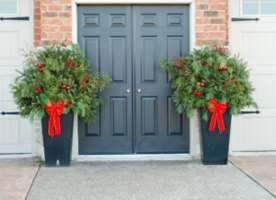 You can add a touch of elegance to the entrance of your home with our outdoor arrangements that use evergreens, branches, holly berries and more. If you have front yard or back yard windowsill planters, that’s a great spot for us to fill with Magnolia berries and branches. Freestanding, tall planters along your front walkway can house beautiful birch branches with rope lights and Evergreen branches for colour. Instead of transporting containers and plants to and from your home, Moon Glow will take care of the details so that you can enjoy the end product. We’ll come up with a Christmas urn design together so our team understands your vision, but it’s up to us to bring all the supplies and complete your seasonal displays. It can be difficult to fit decorating into your schedule during this busy time of the year. It is also a painfully tedious job that will look unappealing if not done well, and that equates to hours of wasted time. Let us do the legwork so you can enjoy beautiful outside Christmas decorations all season long. Start looking forward to the festive season, and request a consultation today for outdoor Christmas decorations, from holiday lighting to urns.